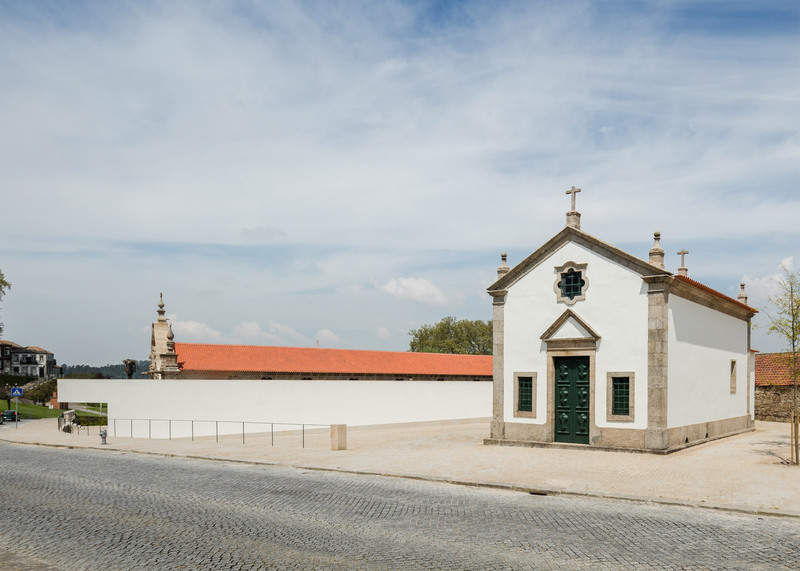 Pritzker Prize winners Álvaro Siza Vieira and Eduardo Souto de Mourahave teamed up to renovate a museum at a historic Portuguese monastery and have also added a new contemporary sculpture museum (+ slideshow). 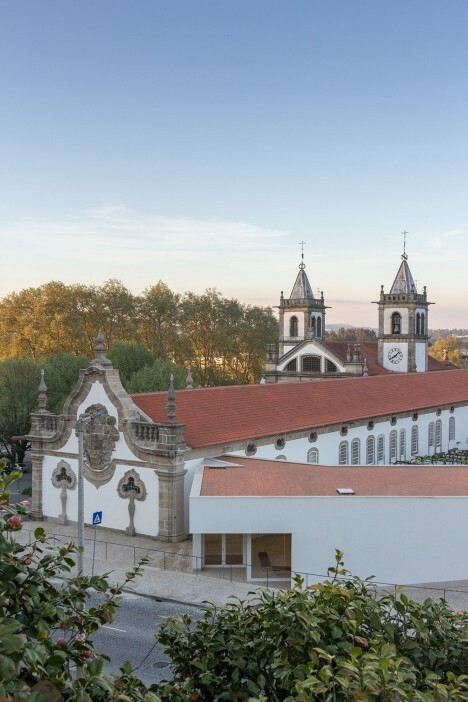 The two Portuguese architects – whose previous collaborations include the2009 Serpentine Gallery Pavilion – partnered on the overhaul of the Municipal Museum Abade Pedrosa, which occupies a former guesthouse at the Monastery of São Bento in Santo Tirso. They also designed a new wing to branch out from one side, which houses the International Contemporary Sculpture Museum. The monastery dates back to the 8th century, but much of the current architecture was built in the 17th century and the guesthouse underwent a conversion in the mid-19th century. 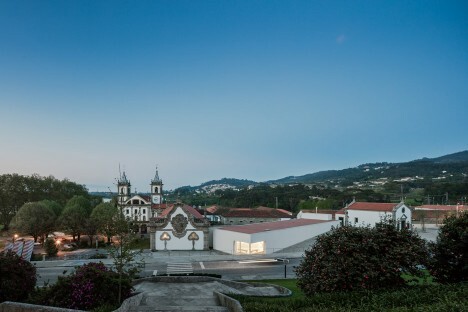 To respect this potted history, Siza and Souto de Moura chose to keep their additions as simple as possible. Their extension, which has one storey above ground and one below, is a long slender building with a white-rendered facade and a flat roof. 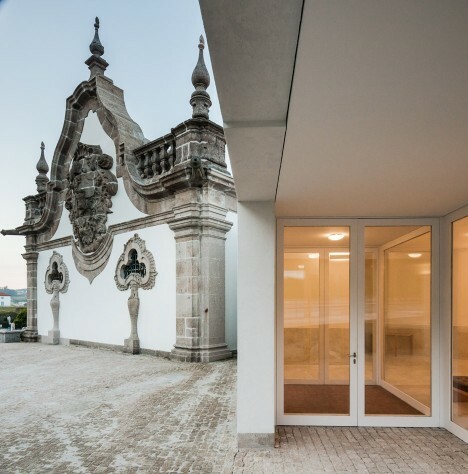 The old and new buildings converge to create a shared entrance beside an ornamental pediment wall. “The connection between the two buildings is punctual and although functionally connects both, it allows to keep them independent in form and language,” explained the design team. 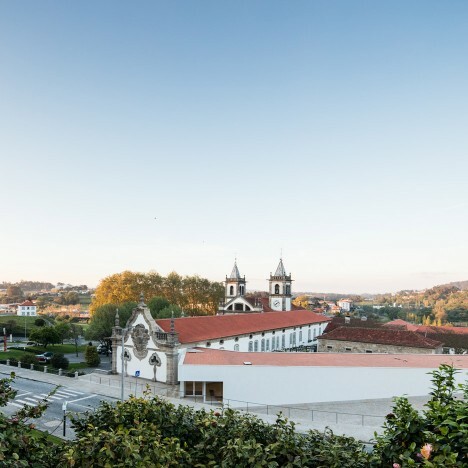 Both buildings feature a clay tiled roof, a traditional feature in Portuguese architecture, and they match one another in height. But one is covered with decorative windows, while the other is largely windowless. A recess in the corner of the new building creates a sheltered entranceway, leading into a shared atrium and gift shop for the two museums. In this way, visitors are encouraged to visit both. 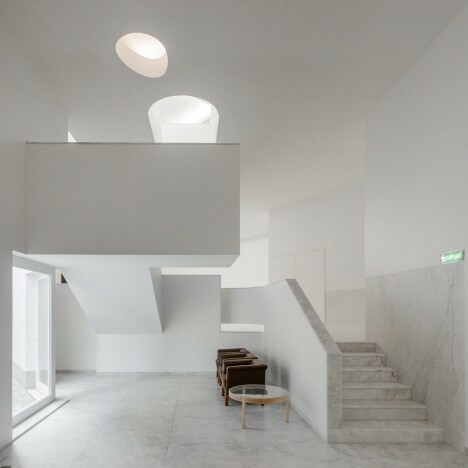 Beyond the atrium, the rooms of both buildings are arranged in linear sequence. 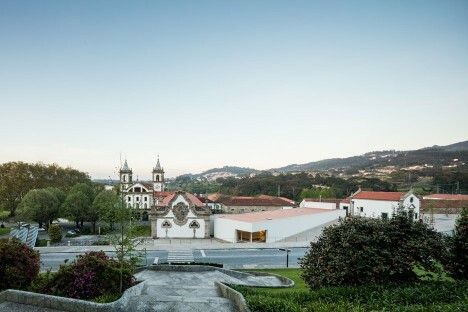 The municipal museum is entirely housed on the upper level of the former guesthouse, and includes a 56-seat auditorium and seven small exhibition galleries. The sculpture museum is arranged over two floors. The upper level contains a cafe, administration areas and an exhibition area, while the lower floor contains a multi-purpose gallery and a study room. 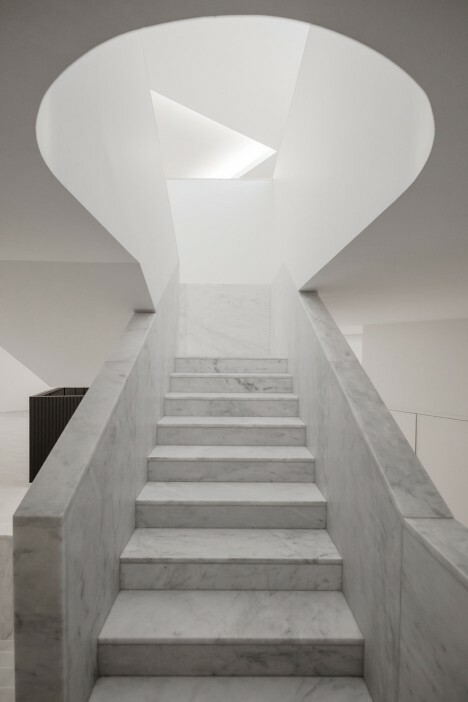 Marble is one of the dominant materials inside the new museum. 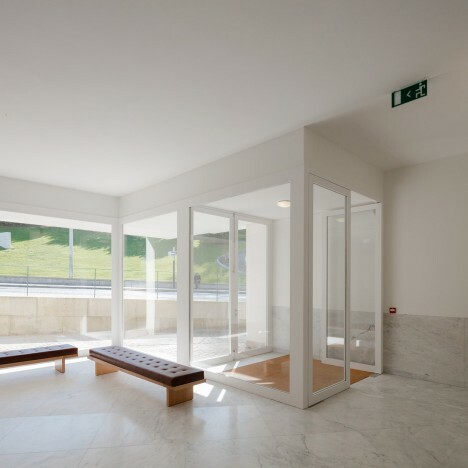 It provides flooring throughout and covers sections of the walls in the public areas. 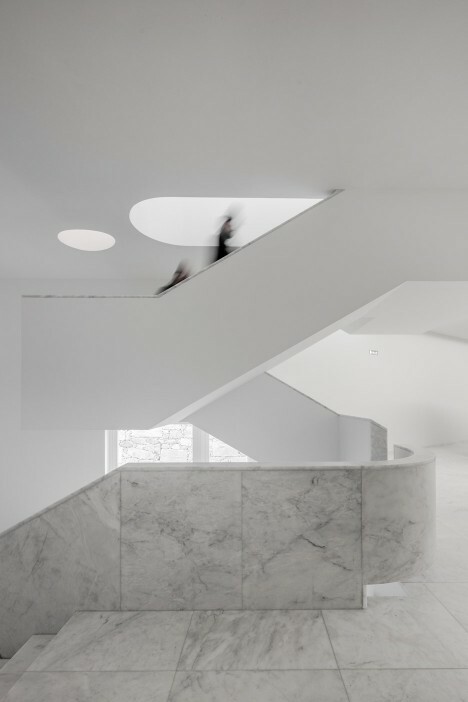 It also covers the main staircase, lending it a sculptural quality. Other visible materials in the two buildings include natural and white-painted wood, granite and white-painted plasterboard. 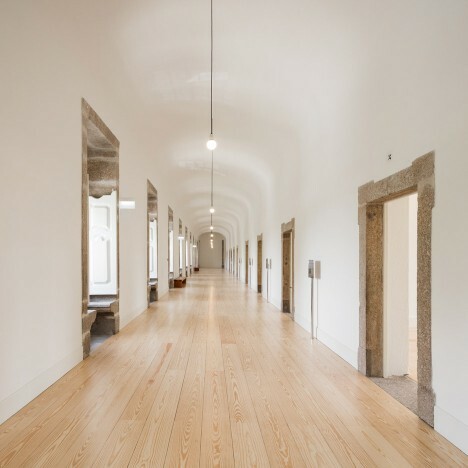 Álvaro Siza and Eduardo Souto de Moura have been friends for decades and have collaborated on a number of projects. 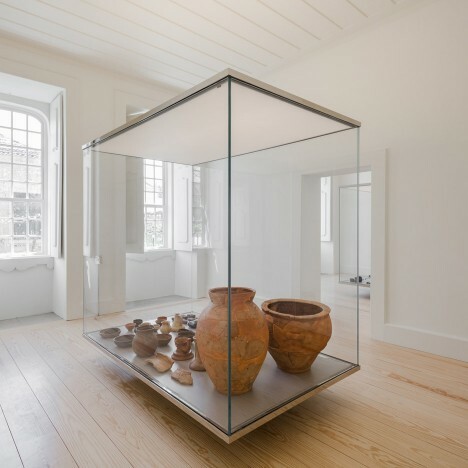 As well as their Serpentine Pavilion, they teamed up on a pair of pavilions at the Venice Biennale in 2012. 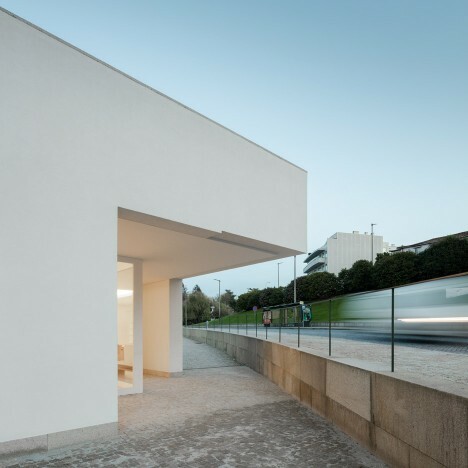 Siza was awarded the Pritzker – architecture’s most prestigious award – in 1992, for projects including the Serralves Museum and Leça Swimming Pools, both in Porto. In an interview with Dezeen, he said that emotion is an important factor in his design process. 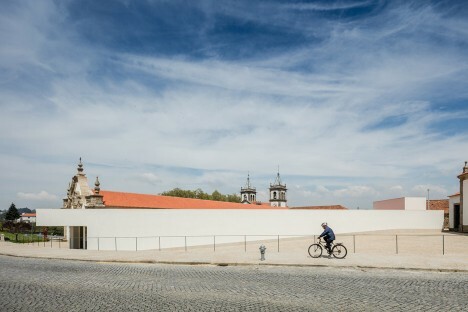 Souto de Moura won the same prize in 2011, in recognition of works including the Casa das Histórias Paula Rego in Cascais.